BD conventional syringes are available with and without an attached needle. BD syringe-needle combinations feature a clear barrel with a bold scale. 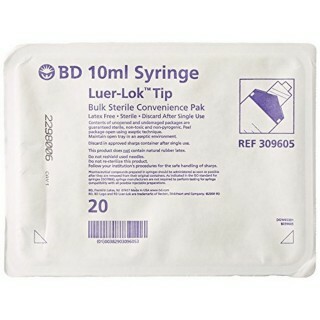 Disposable syringes with a BD Luer-Lok tip, luer slip tip or eccentric luer slip tip can be fitted with either a conventional needle or safety needle. Our luer slip tip provides a friction-fit connection that requires you to push and twist the syringe tip into the needle hub. 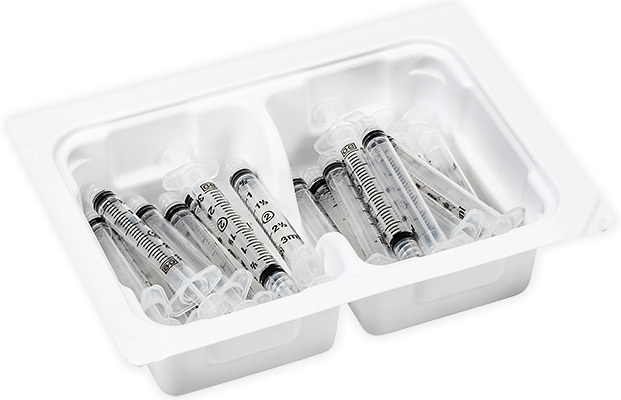 With features like a stopper at the bottom-most position to reduce manipulation, BD Sterile Syringe Convenience Trays help pharmacy staff save time and effort when batch-preparing syringes. 20 syringes only per sterile tray, 12 trays per case of 240. BD Products comply with the regulatory requirements of the region in which these are sold and manufactured. BD Products which are CE marked comply with Medical Devices Directive 93/42/EEC and are manufactured within production facilities that comply with the international standard ISO 13485: Quality Systems - Medical Devices - Requirements For regulatory purposes. All products which are labeled as #sterile# and released for sale by BD are certified to be sterile as long as the package is unopened and undamaged. For those products labeled #sterile fluid path#, only the fluid path is sterile. This product is primarily sterilized via E-beam. Sterilization cycle development/validation is performed to 10-6 SAL in accordance with current ISO 11137 guidelines. All products which are labeled as non-pyrogenic and released for sale by BD have been tested per United States Pharmacopeia (USP) chapter 85 - Bacterial Endotoxins Test and meets limits as specified in chapter 161- Transfusion and Infusion Assemblies and Similar Medical Devices. Representative production samples are collected and inspected in accordance with current applicable product specifications. Inspection records are reviewed and signed off by qualified personnel for product release. The released devices meet applicable BD product specifications.